When a Walmart cashier in Burton, Michigan saw a customer get turned away from the store’s nail salon, she took matters into her own hands. Tasia Smith works at the Subway inside the Walmart and witnessed the scene. 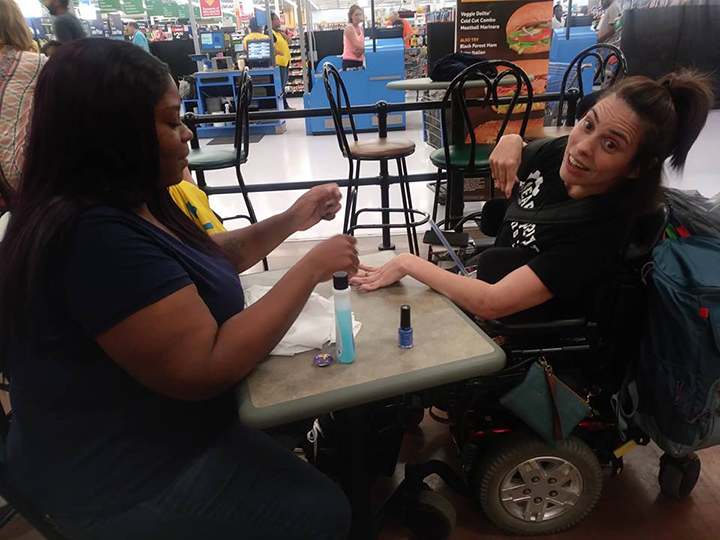 Smith snapped a photo of Walmart cashier Ebony Harris skipping her break to paint the woman’s nails and posted it on Facebook. “I just wanted to post it for awareness and appreciation, because people needed to know what was going on with the business and Ebony deserved all the appreciation she could get,” Tasia told WJRT. Harris said she watched the nail salon, located next door, refuse to do the woman’s nails because her hands shake quite a bit due to cerebral palsy. So, she decided to do something about it. “I just wanted to make her day special. I didn’t really want her day to be ruined. That’s why I did it,” Harris said. Harris says she hopes her actions inspire others to treat people with disabilities the way they would want to be treated themselves. “We’re not trying to bash the nail salon. We’re not trying to make them lose customers, make them look bad,” she said.